One of the early Newlyn School Artists was Penzance-born Frank Bodilly, uniquely the only Cornishman in the first group of artists in the School. Born on 5 December 1860, he was the third son of Thomas Hacker Bodilly, a master grocer employing 11 people and living at 31 Market Place, Penzance. His father later described himself as a miller and corn merchant and became a significant shareholder in Batten, Carne and Carne, the oldest Penzance bank, which spectacularly collapsed in November 1896 (see OTD 15th November). However, Thomas Hacker died in the summer of 1896 so his father avoided the scandal that ensued and the subsequent takeover by the Consolidated Bank of Cornwall. By 1881 Frank was already moving in artistic circles and described himself an an artist in the 1881 census. By this time his family had moved up in the world an were living at Alverton Cottage. He was friends with Thomas and Caroline Gotch and was a witness at their wedding in August that year in Newlyn St Peter. Subsequently in 1884 he married Caroline’s sister Esther Burland Yates, the wedding taking place in Camberley. He must have then been inspired to join Stanhope Forbes and the Gotches in Newlyn, (Stanhope Forbes had moved to Newlyn in 1884) and to try his hand as a painter. He and his wife joined the other newly arrived Newlyn Artists at their lodgings at Belle Vue (Mrs Maddern’s). 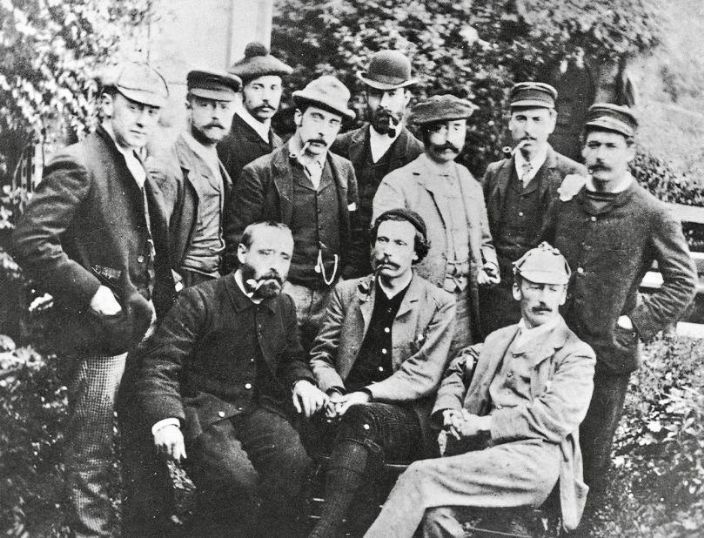 The Newlyn Group in the early 1880s. Frank Bodilly is the young man stanging on the left wearing the deerstalker. In 1886 Frank had his only successes of acceptance by the Royal Academy and exhibited: ‘A Quiet Hour’ and ‘A Street in Newlyn’. Again Stanhope Forbes mentions Frank in a letter to his mother saying Frank ‘was swelling it through the room’. Other works include ‘ Mending Father’s Nets’ and ‘The Burning Ship’ both in the Penlee House Gallery collection. However, by this time Frank was already thinking of giving up painting and in February the Bodillys left Newlyn and he ceased painting. He then trained as a lawyer, as his older brother had done, and became a Judge in the Colonial Service in India. He returned to Penzance on his retirement where he died in 1926.